The messianic grafted in symbol in a whole new design! Made of 925 Sterling silver and set with crushed opals. 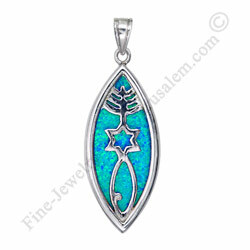 The opals is known to change colors in the light and glimmers in sparkling dark blue and greens.